Small hats, those less-than-full-size confections, go by many names: cocktail hats, fascinators, minis, etc. They are festive additions to outfits for the holidays, weddings, special events, etc., and they're a bit different than full size hats. Here's some advice about how to wear them with panache. Step One. First Thing's First: Choosing the Hat for You. Just like with other clothing, it's important to think about size, color, shape, etc. when choosing a hat. The same hat worn by different people, with differently shaped faces, can look quite different. Proportion is especially important. The smaller the person (and/or the head and face), the smaller the hat that can be worn and still look in proportion. 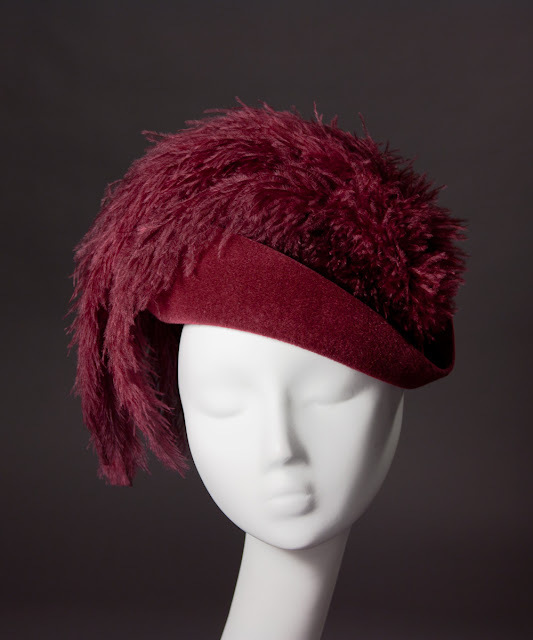 But an average or larger person will probably look best in a slighter larger mini hat. That's why I offer two sizes of small hats- a mini and a 'midi', to give my customers more options. 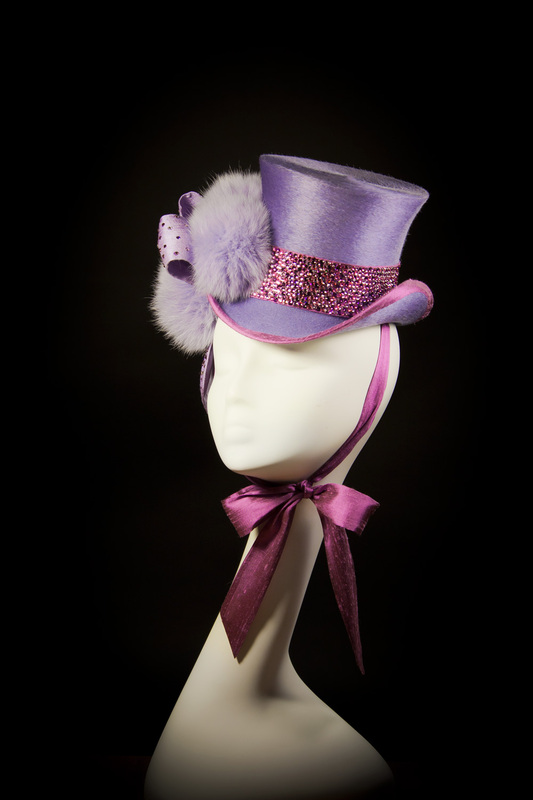 Customers who visit my studio can try on hats to their heart's content until they find the right one, and I also assist online customers to find the best hat choice for them through email. Step Two. A Bit of Practice: Find the Sweet Spot. Now that you've got the hat of your dreams, it's time to figure out how to wear it. If you just pop a mini on top of your head, it will probably look tacked on, it's important to place it carefully so it's flattering to your face. Most hats look better worn slightly off-center, at an angle, and/or tipped forward partially onto the forehead, and this is especially true for small hats. In my product photography, I've placed the hat on the mannequin head in a suggested position for wear, but everyone is different so you'll need to find the right angle for you. In front of a mirror, try it on in various positions on your head, until you find one that looks good. Feel free to play around and try different things! Although I put a label on the sweatband inside at the 'intended' center back of the hat, there is no 'right' way to wear it, only what looks best to you. Take the hat off and flip it over to view its underside. Notice whether or not there is an elastic band and where the combs are, if any, then put it back on the sweet spot, and make a mental note of the approximate spots where the combs are on your head. Step Three. Now the Hard Part, Made Easy: How Does a Small Hat Stay on Your Head? Unlike a full size hat, a small hat does not encompass and grip onto your whole head, so it needs some extra help to stay in place. All of my small hats come equipped with a thin elastic band, a ribbon to tie the hat on under your chin, or combs, or a combination of these. Unlike under-chin ribbons, which are fairly self-explanatory, the elastic is meant to go at the back of your head under your hair. To use it, put the hat on, then pull the elastic gently down in back, pull your hair over it and smooth it down again over the elastic to hide it. If your hair is fine and/or slippery, it's often helpful to give the elastic a little something extra to grab onto by applying a light coat of hairspray to the back of your head or using another texture-adding product. My favorite is Osis+ Dust It by Schwarzkopf, it makes the hair matte but not stiff or sticky. I generally use black rayon-covered elastic bands, but I also offer them in blond, brown, and white, so if you would like one of these other colors, just let me know when you place your order. Combs are also very useful, especially when your hairstyle doesn't allow for use of elastic, or for taller hats, like toppers, that need extra security. For very small cocktail hats that have only one comb, gently pull the ends of the comb away from the hat base and then, starting just above the hat's 'sweet spot' (see Step Two), slide them down into your hair until the hat is in the desired position. As long as the flat end of the comb is facing upward and the ends of the comb are facing down, gravity will help hold it in place. For hats that have one comb at each side, you'll see that these are usually sewn into the hat facing upward. To insert them into your hair, first flip one comb downward with the ends facing your head, press the ends into your hair at its intended spot (see Step Two), swirl the comb around into your hair in a circle or two (to get a good grip on the hair), then turn the comb back upward and push the flat end of the comb (the end sewn to the sweatband) back in toward the center/top of your head so that the comb is completely hidden again under the hat. Then, do the same on the other side with the second comb. If it feels too tight or pulls your hair uncomfortably, try it again with less swirl. If it's still loose, swirl more and start the swirl a little bit farther out from the center of the hat. For extra grip, I often use both combs and elastic. If you would like to use the combs without the elastic, just tuck the elastic away behind the sweatband inside the hat so that it won't hang down and show when the hat is worn. I use good-quality, smooth plastic combs that, unlike cheaper plastic or metal combs which often have sharp edges, will not damage your hair or scalp if used properly (i.e. gently). Personally, I have fine, slippery hair, and find that a dash of OSIS+ Dust It hair powder or hairspray plus a small amount of back-combing in the spots where the combs will go helps them to stay in place even better than swirling alone. To back-comb, apply a small amount of hairspray or hair powder on the spot where you want the comb to go. Pick up a 1-2 inch section of hair from that area, pull it out at a right angle from your head, and starting 2-3 inches away from your scalp, comb it gently backward toward your scalp using a small-toothed comb or brush. This will give your comb a little cushion of hair to anchor into. At the end of the day or after your event, I recommend getting the tangles from the back-combing out by gently washing your hair and working them out with conditioner, rather than trying to comb them out dry, to avoid damage. For a hat that is tall or has tall feathers, you may want to prepare your hair as described above but then wait until you've reached your destination to put on the hat, to avoid damage by bumping up against the top of low-ceilinged vehicles. For custom clients who may be interested, I also have a selection of new and antique hat pins that I would be happy to include in your order upon request, in addition to or instead of combs, elastic, etc. Instructions in the use of hat pins can be found here. Step Four: Make a Commitment. Sometimes people who would like to wear hats more often tell me that they are reluctant to do so because they're afraid that if they take their hat off during the day or in the middle of an event, they will have messed-up hair, especially with small hats that might leave a flat spot. My response to this is that you should think of your hat as an integral part of your outfit, and commit to wearing it for the duration. You wouldn't take your skirt off during a party (I presume), so why should you remove your hat? 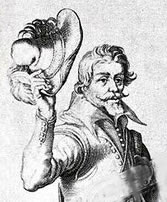 Hat etiquette sometimes requires gentlemen to doff their hats (during performances of the National Anthem, at dinner, etc.) but full size hats are less likely to give one asymmetrical 'hat head', so this is less of a problem for the guys. However, even in circumstances where men are required to remove their hats, ladies are not expected to do so, and rightly so, given the extra effort than goes into securing a small hat to your head. The right hat can be the focal point for your whole outfit, and once it's on securely, you can enjoy yourself without thinking much more about it beyond feeling fabulous. It may take a couple of tries to get the hang of placing your hat and using combs, but once you do, you can wear your small hats with confidence that they won't fall off or slip around. Any customer who would like further instruction in how to wear them is welcome to come by my studio for a free lesson, just ask for an appointment. I would add that if the hat has to come off in the middle of an event, use a hat with an elastic. Wear your hair in a loose bun without too much volume in the front and place the elastic under the bun. When the time comes, take the hat off carefully and your hairstyle should still be camera-ready.